From outdated technical rules to local permitting to incentive policies, there are opportunities to increase the potential for local solar power. This is the fourth of five parts of ILSR’s Rooftop Revolution report being published in serial. Read Part 1 or Part 2 or Part 3. Download the entire report and see our other resources here. circuit (one strand of the local electric grid) is approximately 30% of the peak demand. This 30% represents the most solar capacity that could be installed on a distribution circuit without potentially producing more than the circuit’s load. The 30% was divided in half as a safety margin, making the threshold 15% of peak load. 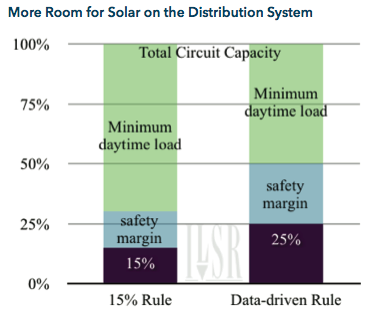 The 15% rule now governs most state distributed generation policies (and is part of FERC’s Small Generator Interconnection Procedures) and has started to create problems in states with the most local solar power development, including Hawaii and California. However, the 15% rule may be too conservative. Research from the federal Department of Energy suggests that daytime minimum loads are likely closer to 50% of peak load, rather than 30%. This means that a more appropriate (and still very conservative) threshold for unintentional islanding is closer to 25% of peak load, rather than 15%. Kona, HI, has a 700 kW solar array that is 35% of the capacity of its distribution circuit, with no reported issues. Las Vegas, NV, has over 10,000 kW of commercial solar PV on a distribution circuit (50% of capacity, 100% during low load) with no reported issues. Atlantic City, NJ, has 1,900 kW of commercial solar PV on a distribution circuit (24% of capacity, 63% during low load) with no reported issues. Energy storage is among other potential technical solutions to the 15% (or 25%) rule. Electric vehicle batteries or other storage connected to the distribution system could absorb some portion of solar electricity at periods of high production and low demand, and push the power back into the grid when it’s needed. Research at the Department of Energy and many private companies continues to search for ways to maximize the penetration of distributed solar power with storage and electric vehicles. Fortunately, the Solar America Board of Codes and Standards has already developed a set of best practices that may significantly reduce the cost of permitting for solar projects. Their exhaustive list of strategies (such as expedited review based on a checklist, email rather than in-person permit submission, etc) can reduce permitting costs by 75%, giving a very different picture. Another potential barrier to fulfilling the potential of solar grid parity are limits on and limitations of net metering. Net metering laws in 43 states allow for on-site solar power producers to rollback their electricity consumption. For every kilowatt-hour (kWh) offset by on-site solar, the customer saves the retail charge for electricity, e.g. $0.10 per kWh. 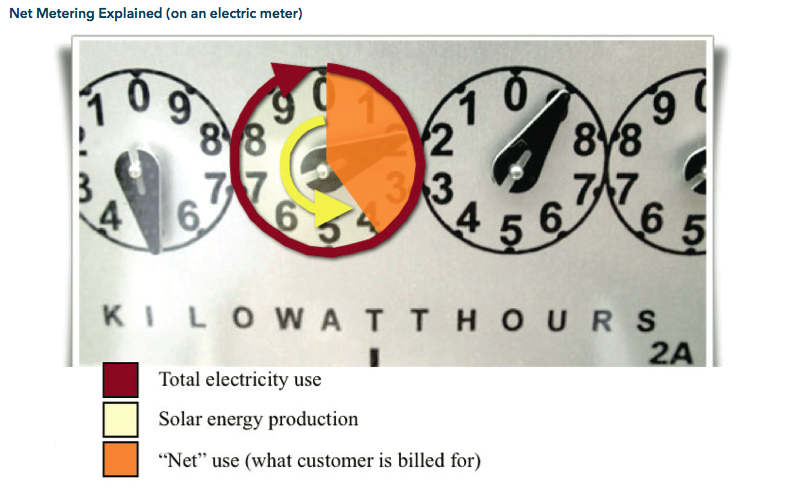 The following chart provides a simplified example, where the customer uses 100 kWh in a month, but because their solar array produces 60 kWh, they only pay for the “net” consumption, 40 kWh. In general, customers using net metering get paid the retail rate for solar electricity so long as production does not exceed on-site consumption (by very much). The advantage of net metering is that people generally find a combination of energy efficiency and solar power that minimizes their electric bill, and the accounting is all handled by the utility using a single meter. Net metering has political advantages as well. Since it doesn’t require any public money (but instead requires the utility to provide the accounting measure), it feels free. One drawback of net metering is that a person must own a suitable, sunny rooftop or open space to install solar. Since only two-thirds of residential properties are owner occupied, and scarcely 25% of residential rooftop space is suitable for solar,5 that significantly shrinks the potential universe for solar power. Additionally, net metering can encourage sub-optimal economies of scale for distributed solar. Since people who regularly produce more solar electricity than they use on-site get paid a very low rate for that power (rather than the retail electricity rate), it discourages people from maximizing the size of their solar project. 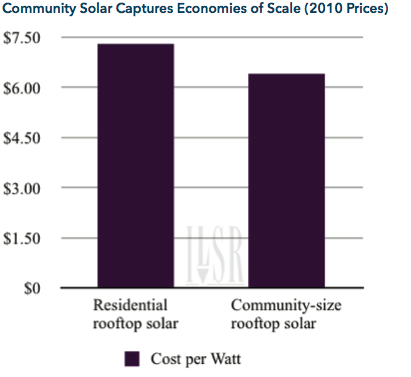 And with steep economies of scale at small project sizes, this means the social cost of solar power is higher with policies that cap project sizes (net metering) than with those that do not. One policy solution to this net metering limitation is generically called community solar. At its simplest, community solar policy means “community net metering.” This policy, adopted by seven states and a number of individual utilities as of 2010, allows customers to build a common solar panel array and share the output via net metering on their individual bill. For example, the electricity from a 30 kW solar array on a nearby church could be shared among ten local owners, each receiving a share of the electricity output in proportion to their ownership share. The accounting is identical to net metering, minus the on-site solar. Customers still cannot get credit for significantly more solar electricity than they consume, but they do not need to have a sunny rooftop. Another drawback of net metering is that it is often limited on a system-wide basis in many states, to a certain percentage of a utility’s load or peak load. California, for example, requires utilities to accept up to 5% of their peak demand from net metering, but no more.8 Most states limit net metering to 1% of a utility’s peak demand or less. 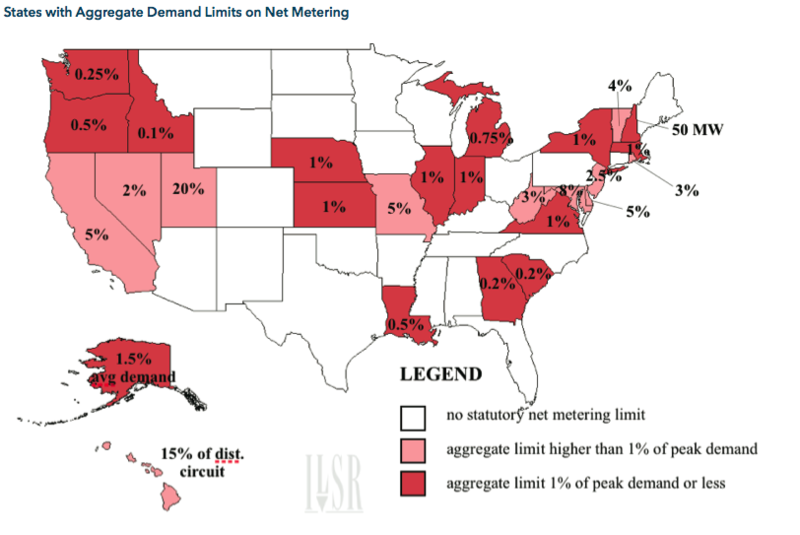 The following map shows states with an aggregate net metering limit.9 States in dark red have limits 1% or less and states in light red have limits that are higher. 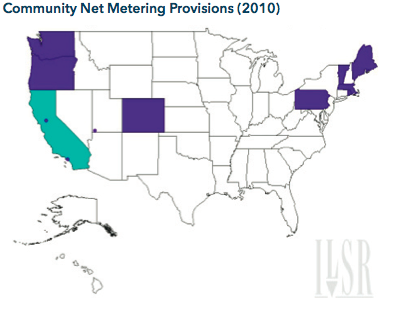 States with no color have no statutory limit on net metered systems. Fortunately, states can change their aggregate limits, as California did in 2006 (to 2.5%) and 2010 (to 5%).10 However, there’s no guarantee of a sufficiently favorable political environment in other states. John Farrell directs the Democratic Energy program at ILSR and he focuses on energy policy developments that best expand the benefits of local ownership and dispersed generation of renewable energy. His seminal paper, Democratizing the Electricity System, describes how to blast the roadblocks to distributed renewable energy generation, and how such small-scale renewable energy projects are the key to the biggest strides in renewable energy development. Farrell also authored the landmark report Energy Self-Reliant States, which serves as the definitive energy atlas for the United States, detailing the state-by-state renewable electricity generation potential. Farrell regularly provides discussion and analysis of distributed renewable energy policy on his blog, Energy Self-Reliant States (energyselfreliantstates.org), and articles are regularly syndicated on Grist and Renewable Energy World. John Farrell can also be found on Twitter @johnffarrell, or at jfarrell@ilsr.org.